Are you going to trailer your rig now? I would like to keep it "streetable" for a year or so. Right now we don't have a tow rig or trailer, but we hope to get an Excursion (Powerstroke 4x4, of course) late this fall and trailer not too far behind. Just depends on funds. BethAnn would also like to enter Peterson's Ultimate Adventure with it! :roll: I'm looking at tires in the 38-40" range and would like to have radials for the streetability factor. BFG KM2s would be my first choice, but it will most likely be whatever set of used tires and wheels I find after I sell my Mustang SVO. The most likely candidate would be some Super Swamper Irok radials. I want 17" wheels, too, so that hurts my selection in the used market. 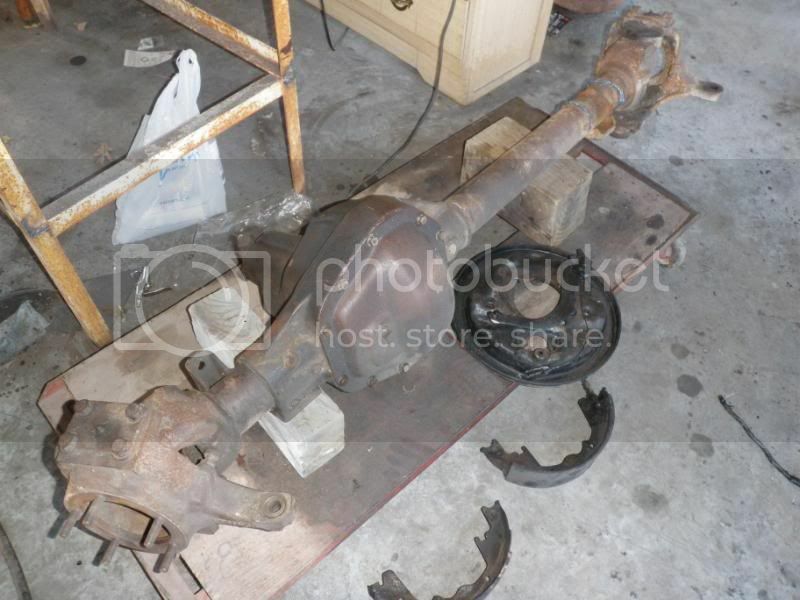 The front axle I am leaving as an open diff for now, and the rear will have a Detroit Locker. Locked in the rear, open in front--same as I have now, so I'm used to driving that. My tags area also good through June of 2010. I might as well try to see if it will pass a Missouri inspection by then, right? Looks good. keep up the progress I know it gets dificult. If your long term plans are to have it on a trailer, why not lock the front now? Cheaper to do it now than later. I want a selectable locker when I do lock the front. The $900 or so for one I can use much better in other places right now. I'd like to learn how to drive the thing again BEFORE I start breaking stuff! :roll: Many of the trail breakages I've witnessed have involved stressing front end components while locked, then...POP! What I will likely do is drive it open with the stock shafts (the Dana 60 I got has stock 35-spline inners and 30-spline outers) for a while. When I get a locker for it I'll also upgrade to 35-spline outers as well. I'd rather do any wrenching at home instead of on the trails. Ive had both, and IMHO dont get the Irok radials... get the bias. They are just as quiet on the street as the radials you really cant even tell the difference on the highway. The bias wear a little faster but not by much. Neil and I got some more work done today. BethAnn had the camera on a ladies-only float trip this weekend, so no pics this time. Neil finished getting the Dana 60 carrier and R&P set up (after taking it out and putting it back in many times to get the right shimming). 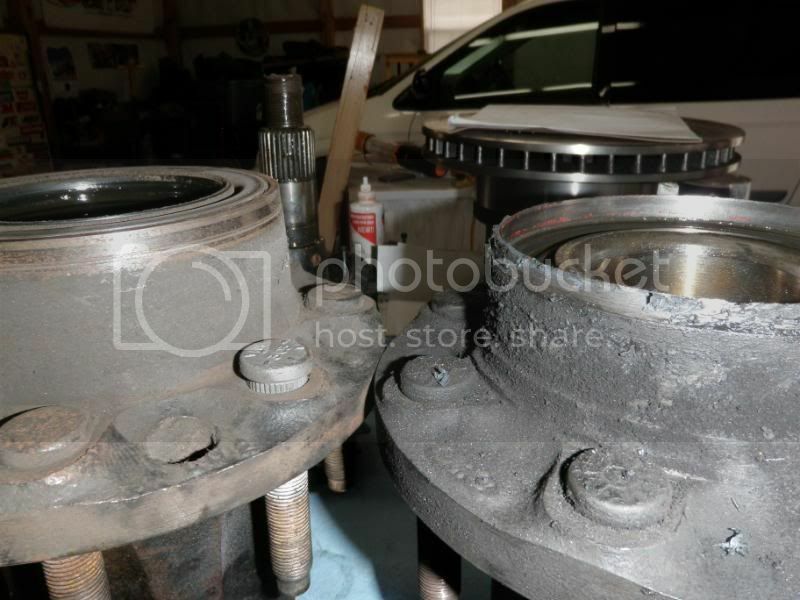 Now all we have to do is clean out the tubes, put the shafts back in, and get the new brake rotors and calipers on. Anything else on the 60 is getting the old perches cut off and new ones put on. While he was working on the D60 I tore into the Sterling. Took the drums off and found that the driver's side had a leaky hub seal that had had a "farm truck fix" with silicone that really didn't fix it. 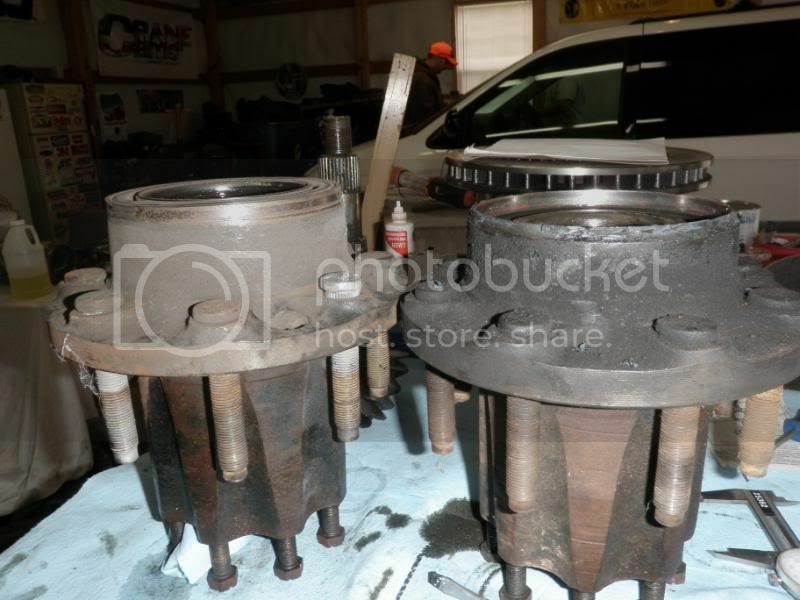 Now I have a proper spindle nut socket and a new seal for that side. The passenger side all looked good. We pulled the shafts out and they looked good (and BEEFY!). Then the carrier came out and I cleaned up the inside. The Sterling's hollow now. I have to say that the Sterling looks like it will be PLENTY strong. It's parts make the 8.8" look like it was made out of Tinker Toys. We might be able to get a bit more done during the week but next weekend Neil will be out of town. If I make it by his place this week I'll try to remember the camera. 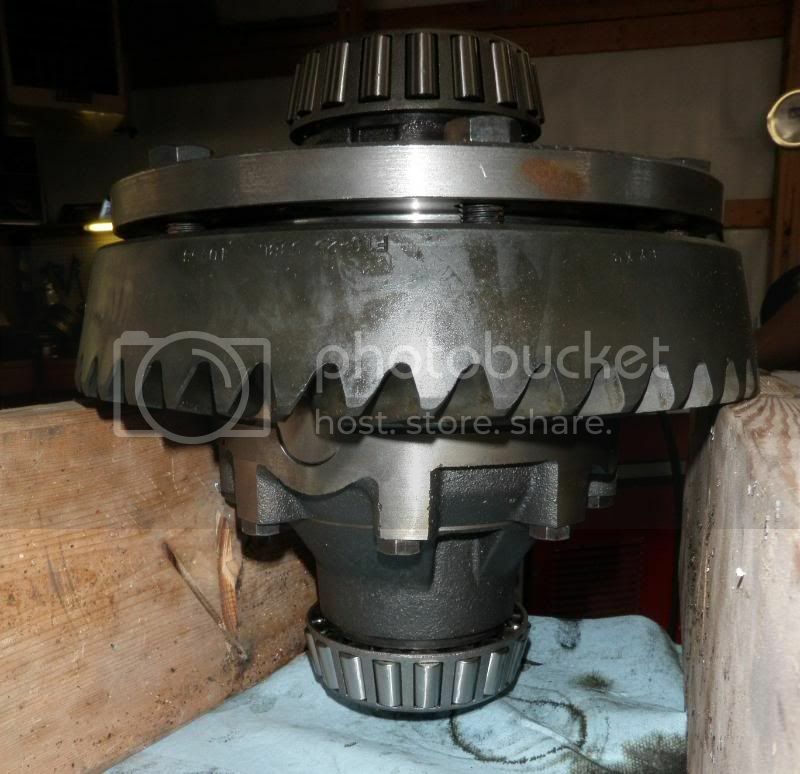 I plan on using next weekend to separate the Dana 20 transfer case and 3-speed and get a look at the D20 to see what it needs. I'll probably start my doubler thread then. I was hoping to have done that already but I had to get the Waggy back in shape, and it pretty much is now. Cant wait to see more progress, this thing is gonna be awesome! Do you know if you will be ready for fall crawl? We might be doing some long nights, but I really want to make THIS goal (since Memorial Day didn't work out). Got started taking my 3-speed and Dana 20 apart to build my doubler today. The doubler build has its own thread: http://www.explorerforum.com/forums/showthread.php?t=253590. So it looks like I need a replacement hub. They should be the same--they had the same Ford part number cast into them. You can see some parts from the nasty rear brake in front of the Dana 60. We also discussed some steering options and a really leaning towards high steer. As for the doubler, we could make the 1354 range box look purdy and not use silicone to seal the plate after cutting it--Neil just picked up a TIG welder. We might get some more done next weeked--stay tuned! On my explorer with 37s the Gen 1 box, just couldnt do it very well in most situations other than street driving. Not a whole lot to update other than the diffs are all set up now. The Sterling has all the brackets cut off and the leftovers ground off and smoothed in preparation for new mounting points. 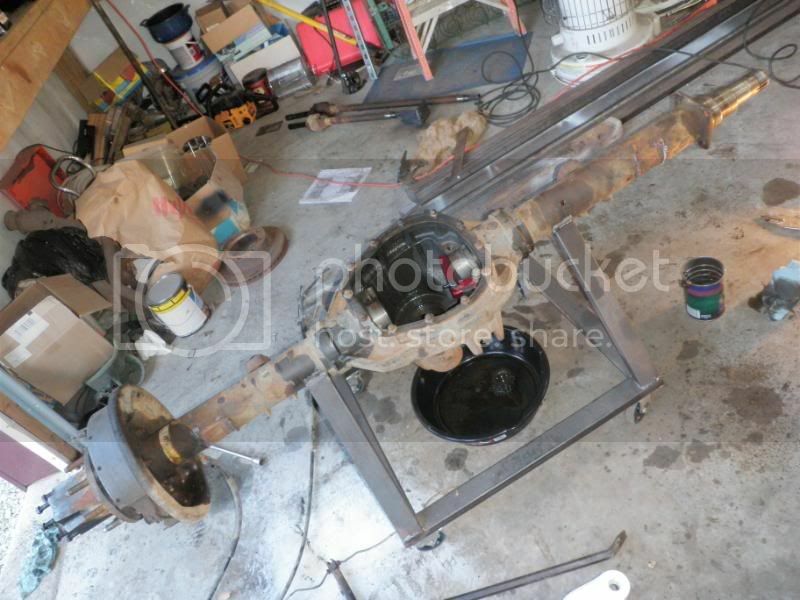 Cleaning up the Dana 60 and getting all of its brake parts on is next. Some parts acquisition has been delayed due to another vital part of the build...GETTING OUR TOW VEHICLE! Which, when you think about it, is also part of this build. Is your rig still driveable? If so are you gonna bring it out in March?? Might as well, before tearing into it all the way. We'll see! It might be under the knife by then, finally. I need to get the new axles under it so I can sell the existing ones (I already have a buyer). Then I'll use those funds to get the set of high-steer arms and hardware I need. All I have to do now is get some roller wheels & tires so it can sit on its own weight. Yup, still need a hub for the Sterling. I'm looking forward to going to SMORR again but we'll see when that will actually be! This weekend will probably be the one that the Explorer goes to Neil's shop and stays there. Time to start making progress! Let's get this done!! We have a TOW RIG, finally. Fun times!! I am really excited. This has been a long time coming. I remember going to pick up this Explorer, about 300 miles to Nebraska in 2005. All manual, rubber floors baby! I remember seeing it and saying..."Really? That's what you want to buy?" But I came to love it in short order and it has been a lot of fun ever since. 3800 mile round trip in 2007 (north through South Dakota, to Montana, through Idaho to Moab, then to Ouray and back home through Kansas!! ), several trips to Ouray, several wheeling trips, all driven there and back with no complaints from the little Ex. But the time has come for a true off-road only conversion and the reliability (we hope!) of a tow rig to get us home.